If you are planning a trip to Northern Africa soon, you may consider Tunisia as a potential candidate. No matter if you are a fan of Star Wars or simply enjoy architecture, these locations are worth a visit. As an architect, I am fascinated by how these constructions previously existed and were accommodated in the film with so much respect for the local culture. In the same way, brand new creations blend quite well with the vernacular landscape. Most Tunisians, who haven’t even watched the movies, have kept the sets in remarkably good conditions. On one hand, they still make a lot of money out of it. However, I am more inclined to think they found something of their own in those excavated constructions made of earth materials – which wasn’t an accident by the way – and has become part of their current identity. You don’t have to travel to a different galaxy with a Millennium Falcon to experience quirky sets, George Lucas made it easy for you. Hope you enjoy visiting these places and be careful since some of them are quite dangerous. My favorite was #2, yours? 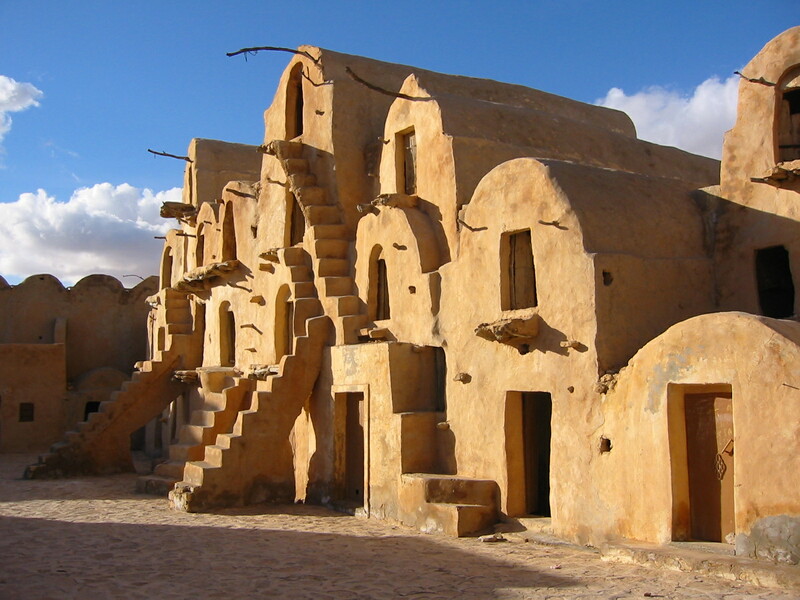 The planet Tatooine got its name from Tataouine, a town located in the south of Medenine. Most of the scenes were shot in the hills and villages surrounding the town. 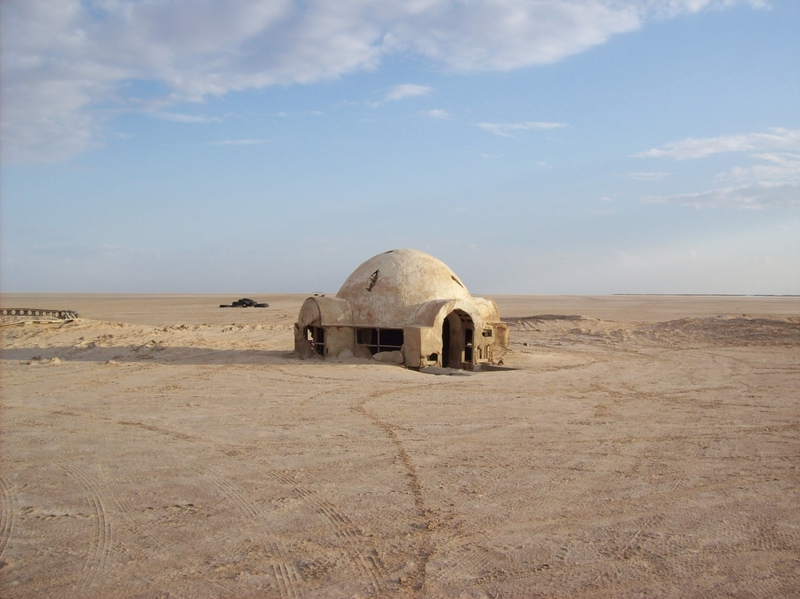 A little further south is located Ksar Ouled Soltane a grain storage facility that was used as a background for some of the Slave Quarters shots in Episode I.
Lars’ home is located at Chott El Jerid (Tozeur), a vast dry salt lake flats that covers a huge area on the west side of central Tunisia near Algeria. Because the Lars Homestead interior scenes were shot somewhere else, the crew had to dig some craters next to it, to make you believe there’s actually an underground structure in the movie. Some memorable scenes were shot here, including Shmi Skywalker’s funeral in Attack of the Clones, and the final shot of Revenge of the Sith. Although it was falling apart, fans are now taking care of it and you can actually help too. 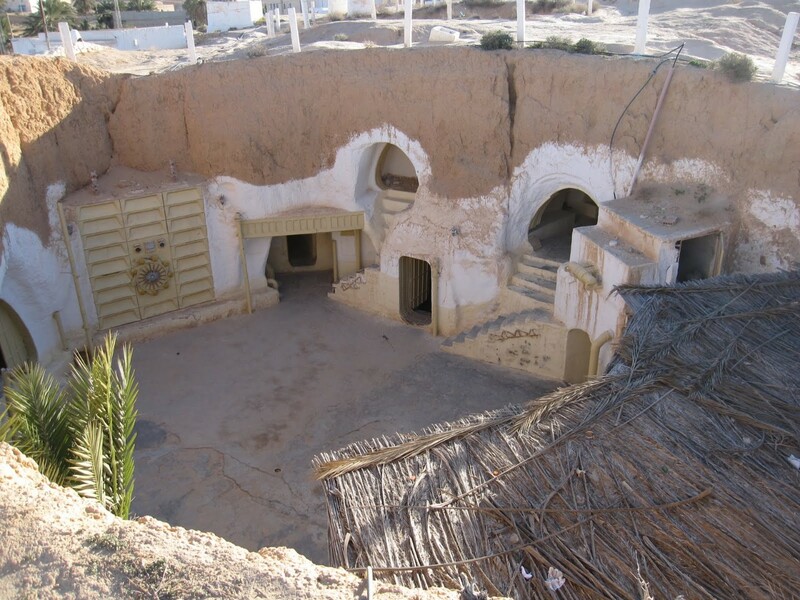 After the fall of the Republic and the near-extinction of the Jedi Order, Obi-Wan Kenobi spent his exile in a simple adobe house located in Djerba. This little house is actually used by fishermen as a storage space. In Episode IV Luke and Obi-Wan meet Han Solo and Chewbacca for the first time here. This location has remained untouched as many Tunisians, despite not having watched the movies, have kept the set intact. You can see the whole town: the gates of Mos Espa; the Pod-racing arena; the gallery and the Mos Espa streets with Watto”s shop, the market and Sebulba’s Café. The Jedi duel between Qui-Gonn and Darth Maul in Episode I was shot here. 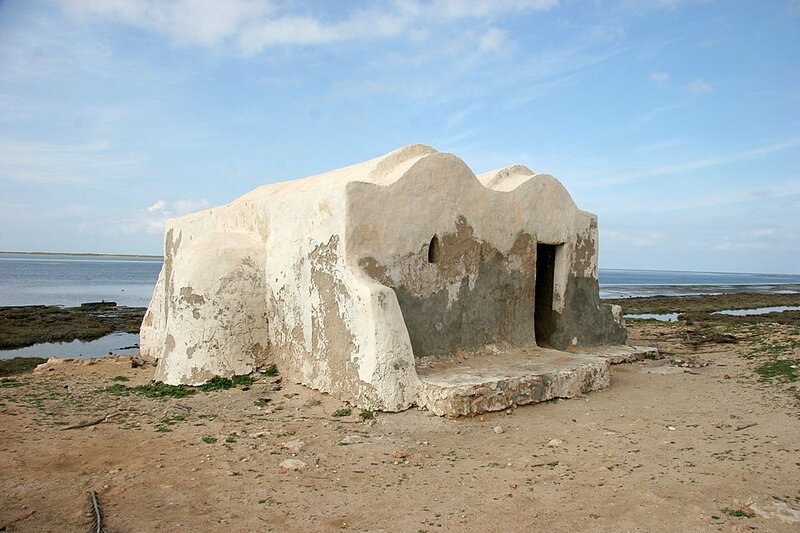 The Hotel Sidi Driss, located in Matmata, served as the interior of the Lars homestead and is at a different location than the igloo exterior of Luke Skywalker’s home. Aunt Beru’s kitchen is still there, but except for some fiberglass and wooden frames, and the fresco on the dining room ceiling, you won’t find anything else. 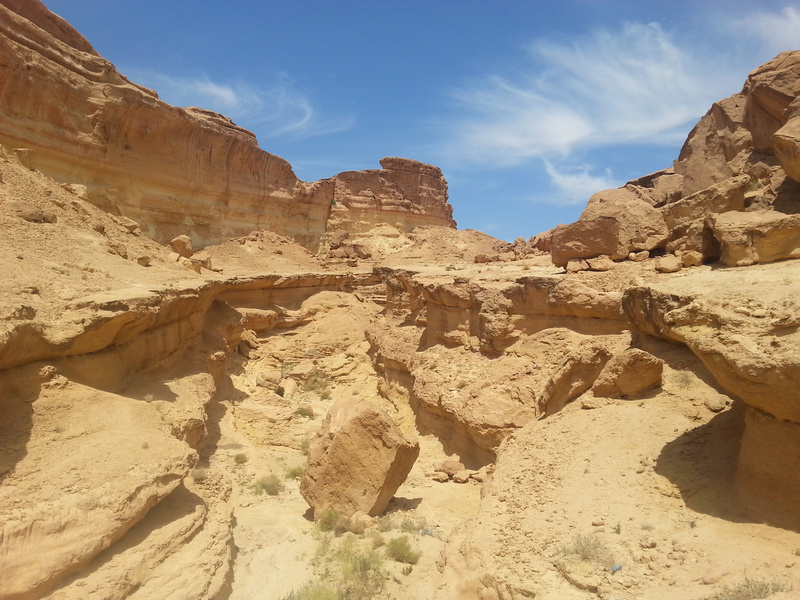 Sidi Bouhel, better known as the Jutland Wastes, is a canyon used in 1976 for no less than 9 shots (Raiders of the Lost Ark and in The English Patient among others). The inside is a narrow gorge walled by two hundred foot high cliffs and a wide, flat wadi that runs from Jebel Krefane down to the chott. 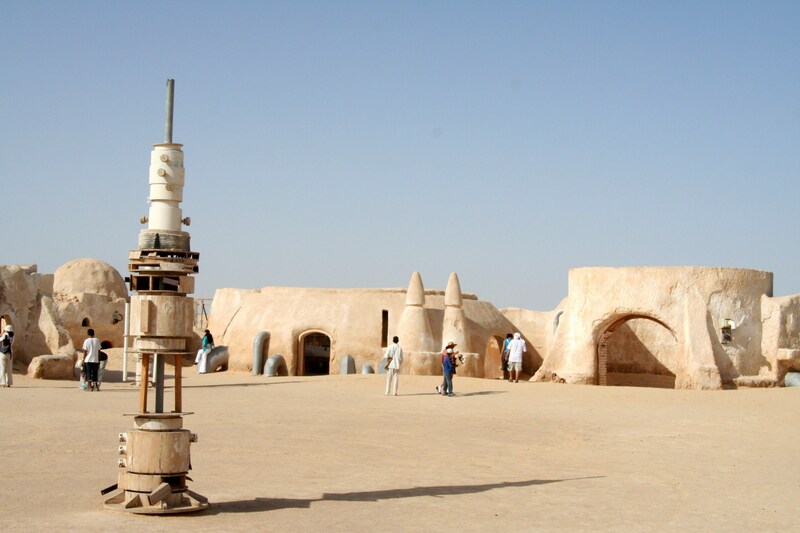 Luke was here while being attacked by Tusken Raiders, and met Obi-Wan Kenobi for the first time too. Just outside the mouth of the gorge Imperial Stormtroopers attacked and massacred the Jawas who sold the droids on to Uncle Owen. 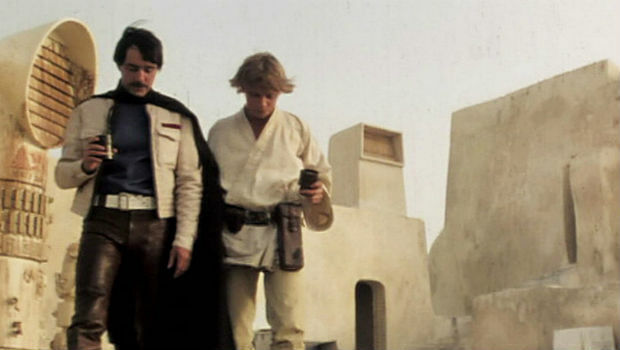 Tosche Station was a location on the desert world of Tatooine where Luke Skywalker, prior to becoming a member of the Rebel Alliance, spent time with his friends. The station also provided services such as vehicle repairs and equipment recharging. Tosche Station was supposed to appear in Star Wars: Episode IV A New Hope, but was cut from the film. 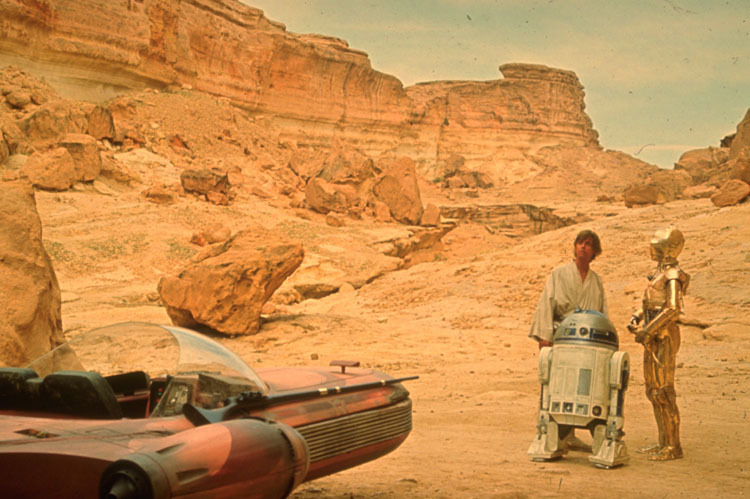 The scene was, however, released in the deleted scenes of the special features of the Blu-Ray release of the original trilogy. Don’t miss Mosquée Sidi Jmour just behind it. Tags: Architecture, design, Film, Instagram, Photography, Star Wars, Travel, wanderlust. Bookmark the permalink. nr 6 … help where am I ? Nice job! Ha, I can see another fan here 😀 Which was your favorite movie? It’s quite dangerous to visit this place actually! 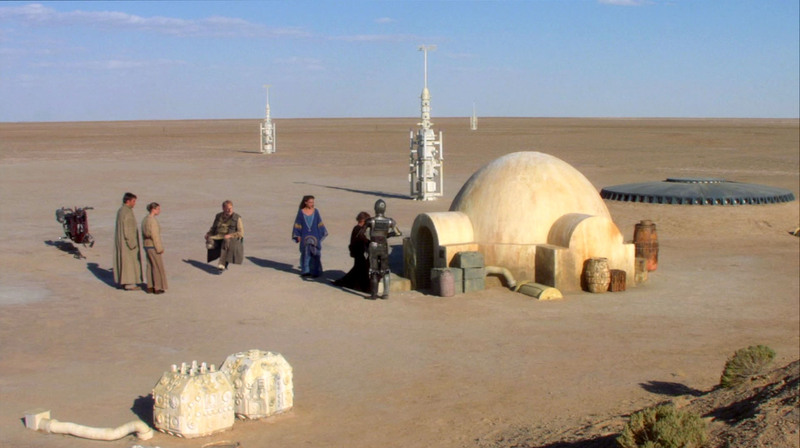 This is a fun and eye-opening post, Virginia, because I did not know about the original locations behind the iconic Star Wars scenes. This is embarrassing but I never asked your name! Would you rather not say? I’d really like to visit all of these locations some day although some of them were very dangerous (Djerba got several terrorist attacks recently). I should have signed off as Arundhati right in the beginning 🙂 It is a mouthful. I do remember the Tunisian attacks. It was in Djerba, was it? It is awful that the world has so much beauty in every corner, but ground reality keeps them away from our reach. The name came late to the party 😉 Well said. Every place does deserve a chance. Here’s to that thought. heheh another fan of Star Wars? Which was your favorite?